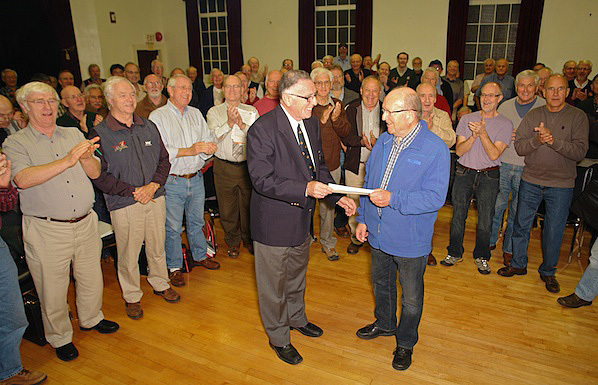 Bob Burrows (right) of First United Church Vancouver receives an $8400 cheque from Bud Phillips of Vancouver Welsh Men's Choir while choir members applaud. The money was raised at a joint concert with the renowned Trelawny Male Choir of Cornwall, England. It will be used to support a respite program for Downtown East Side residents. Vancouver Welsh Men's Choir and visiting Trelawny Male Choir from Cornwall, England, staged a fundraising concert at St. Andrew's Wesley United Church Sept 27, 2011. With nearly 80 voices from each choir, the packed audience was treated to a wide choral repertoire of traditional, spiritual, and show tunes. Local Cornwall Society members in the audience showed their appreciation by singing and clapping along while exuberantly waving Cornwall flags. The closing number "Trelawny", the "national anthem" of Cornwall, sung by all 160 choristers, rang throughout the fine acoustics of SAW. Proceeds from the evening event went to support a new United Church initiative, an island respite program for Vancouver Downtown East Side residents. The program will enable men and women, in groups of 10–12, to travel to an island a few miles from Horseshoe Bay. There, they will experience a brief holiday respite away from home, with an opportunity to garden, enjoy good meals, and hike on forest trails. Transportation, food, accommodation and supervision will be provided for each group. The program seeks to address the respite needs of people who live each day on the margins.